We take a proactive approach to IT support and strive to provide efficient and friendly IT services and support that will add value to all of our clients – giving you more free time to focus on running your business. Our offerings are split into two categories; remote support and on-site support – we also offer support and maintenance agreements, taking a proactive, hands on approach to our customer support. 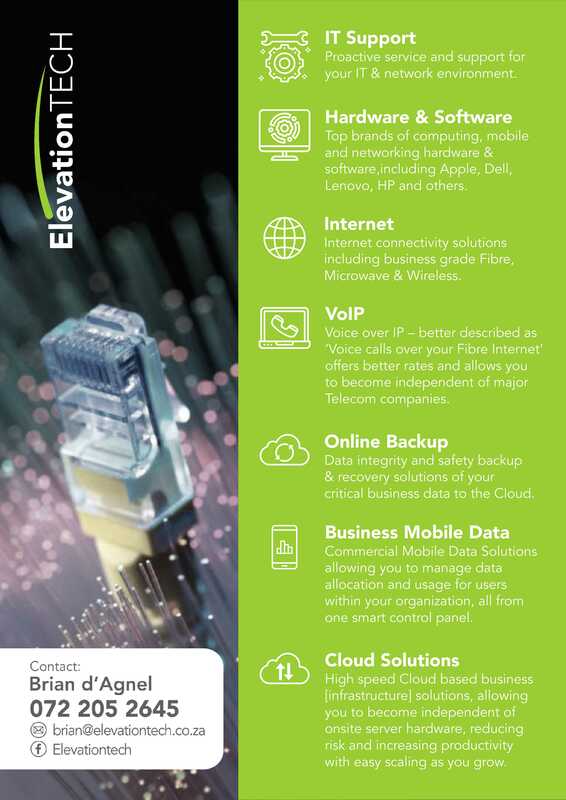 Implementation and management of Internet Connectivity, which includes Fibre, Microwave/wireless, ADSL or Mobile LTE. Or a combination thereof for fail safety. Google Apps offers simple, powerful communication and collaboration tools for any size business – all hosted by Google to streamline setup, minimize maintenance and reduce IT costs. Online cloud backup solutions offer you an affordable and easily managed solution to the problems presented by ever-expanding data. With the importance of your data to your business and the risks of accidental file deletion and hard drive crashes. 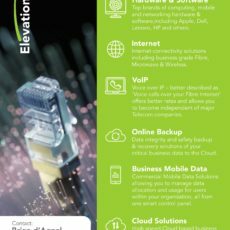 ElevationTECH has wholesale re-seller agreements with the agents of all major hardware & software brands in South Africa. We offer consultation regarding the best fit for your business and sales at competitive pricing.